Watermelon contains the non-essential amino acid L-citrulline, which improves blood flow in the body through dilation of blood vessels. Since L-citrulline helps keep the blood moving, energy levels go up and endurance levels tend to rise. Researchers from the University of Cartagena in Columbia investigated the potential of watermelon juice as a functional drink for athletes, focusing on L-citrulline. The scientists tested natural watermelon juice, watermelon juice enriched in L-citrulline and a placebo drink containing no L-citrulline on volunteers one hour prior to exercise. Both the natural juice and the enriched juice helped reduce the recovery heart rate and muscle soreness the next day. However, L-citrulline in the natural juice appeared to be more bioavailable, meaning in a form the body could better use. 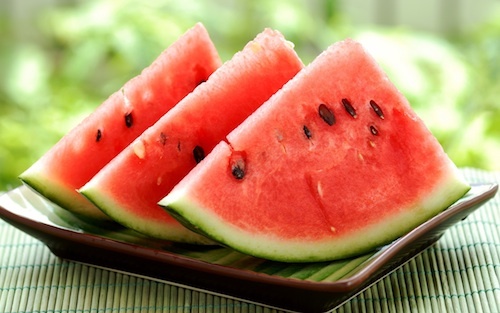 In addition to post-exercise recovery, watermelon is known to improve blood flow and lower blood pressure. L-citrulline has also been used for treatment of symptoms associated with Alzheimer’s disease, atherosclerosis, canker sores, erectile dysfunction and fatigue. If you’d like to make your own refreshing, naturally sweet watermelon juice, it’s easy to make in a blender in less than 10 minutes. Cut the watermelon into chucks, removing the seeds and rind. Scoop chunks of watermelon from the rind into a blender. Cut the lime in half; squeeze lime juice (1/2 lime) into the blender. Blend watermelon and lime juice ~30 seconds. Add sugar or honey as needed to taste, blending to mix. Pour directly into a glass over ice.